School is out and you're probably wondering what to do with the kids in the next 5 weeks or so. Here at The Climbing Works, we aim to help with our range of Kids and Family sessions running throughout August. These are perfect for any kids who are really keen to get into climbing. Over 3 consecutive days, the kids will learn basic climbing technique, balance, strength and how to keep themselves and others safe while climbing. Each session is 1.5hrs and ran by our experienced coaches. This returns for its 2nd year in August. A fantastic event which had the parents pleading with us to run it more often. This is open to all our regular kids club members and those who complete the 3 day introduction courses (see above). The festival is all about the kids having fun, receiving prizes for effort and entertainment and helping out other participants. Book fast as last year we ran out of places. 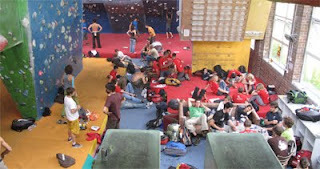 Read a blog on last year's Young Climbers Festival. Tonight is the technical briefing before the World Cup and The Climbing Works is awash with International WAD's. The British team are here of course, as well as the sole Irish competitor - the British Bouldering Champion Nigel Calender (he's from Limerick). There's an excellent atmosphere and you can tell it's going to be a cracking weekend of climbing. Make sure not to miss out. Male qualification starts at Noon on Saturday and the Female qualification kicks off at 3.45pm. On Sunday the Semi's start at 10:30 with the Finals starting at 4.45pm. It's all part of the Cliffhanger weekend so there will be plenty to do between times - just check the Cliffhanger website for all the going-on's. The World Cup wall in Millhouses Park. Impressive!